Captain, you're so young, how did you get started knowing and loving the sea? In Augusta where I lived as a boy, a city of about 1000 inhabitants sited in a famous winemaking area overlooking a very rough sea right where the Indian Ocean meets the South Pacific. My family house overlooked the ocean and my father, a fisherman, took me with him to fishing sharks. I liked to get with him, even tough sometimes I suffered from this rough sea. Although you suffered from seasickness, why did you decided to work aboard yachts? This area of Australia isn't so peopled, but nature and sea are wonderful. I remember I sat long at the bay window in the living room looking at waves and fisher boats crossing the ocean. Daydreaming in front of the sea, I decided to ship. How did your maritime training get started? I say, I never liked to go to school, so I got to unwillingly till up 15 years, namely at the end of compulsory schooling in Australia. I mean, I took so the opportunity of quitting the school. Then I began working as deck - hand on ferries on the route Perth - Rottnest Island, far about ten sea miles from Perth. This island is beautiful and visited by lots tourists. When my parents split up, I got with my mother to Perth and entered the Coast Guard. I say, even though I had suffered from this separation, moving to the new city made for my professional training. What Master training courses did you take? In Australia the Rules for the Captain's Certification are severe. Suffice it to say I've been deck - hand for 4 years for gaining a sufficient on the water experience for the Captain's First Certification. By the Australian system a day of training is equal to five hours actually spent at sea by the trainee. I mean, in Australia a skipper is first required to gain experience at sea. For the First Certification I've had spend thirty-six months at sea, while the second and the third ones have taken eighteen months each. Moreover, I come from the Perth's sea, one of the ten worldwidely windy seas, so the training was severe. All in all I'm very happy to command "Salacia", a wonderful 34 metre yacht, now, aged only 27, and proud of all sacrifices done for. What are the yachts of your career before becoming Master? Held the First Certification I worked as chief mate on board ferries, and after the Second Certificate I qualified as Ferry Captain. It's interesting to know that the ferry "Super Flyte" of the Boat Torque Cruises Line, my longest work, has been sold to Italy for crossing between Naples and Capri. In 2001 I quit this job and began working as second mate, and then as chief mate on board "Lazy Z", a well - known 51 metre yacht chartering in the Caribbean. Thereafter I come back to Australia where at the "Antal Ships" yard I looked after "Perfect Prescription" (54m) and "Seabowld" (53m) as captain, then working as "project Coordinator as Commissioning Captain" with two functions to fulfil: joining on designing superfast ferries and driving them for sea trials. This yard is the world leader in building fast ferries; in fact, these crafts can reach a maximum speed of 48 knots with lengths from 40 up to 126 meters. At this yard were built ferries used in the Canaries, Ontario Lake, and Tahiti. Moreover, the "Austal Ship" has built many yachts for the Australian and Yemenite Coast Guards. What about your most beautiful experience as Master? In February 2005 my son's birth looked me like a prize given me for having held the Master's Certification and all this matched with the command of the "Salacia" of the "Evolution Yachts" yard in Perth. I really like this yacht. Could you tell us something about your worst trip for sea and wind? The trip the like of which I've not experienced since was last year, in November, on board "Lady Z" while crossing the Atlantic. I remember four long days of heavy weather going on during the entire route to New York, the destination of the journey, as requested by the owner. The height of the waves overcoming the deck was 7 - 8 m. That was the thirteenth yacht's cross and my fiftieth one. Fortunately everything turned out well. What about the most useful innovations in the field of yachting? A great advantage to the navigation, I think, is actually from the electronic equipment as an "integrated system" on board, since the different position fixing devices are capable of dialoguing each other making possible to find fix and coordinates soon. What are the main characteristics, you think, to being a "good" Master? A good Master is required to care yacht and crew carefully. To do this kind of work, it's needed to have some skills in financial and accounting management and get on with owner, guests and crew, of course. 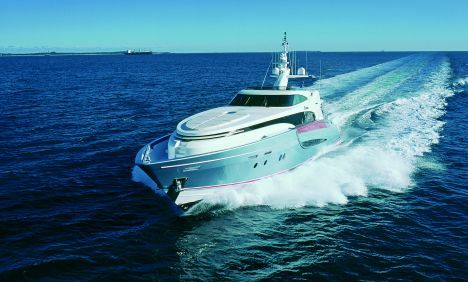 What do you think about the yachting world in which you usually operate? It's really a great opportunity to know people, places, but it's necessary to keep life aboard and life ashore separate. Aboard we offer high level services, while ashore, at home, our life is in a bit of rut, is "normal". At home I get a normal life with my wife and my son, so sometimes it's difficult to pass from a high level period to a daily life even looking "banal". To do that it's always needed to keep one's feet on the ground, on the ground. The worst experience as Master occurred at sea: the beginning of a fire burning in the engine room on board a new vessel during sea trial. It was put out in only 15 - 20 seconds by the Chief Engineer, but those were the longest ones of my life.